We made the long trip to Palma having not sailed for well over a month, due to our boat being container-bound since Miami. 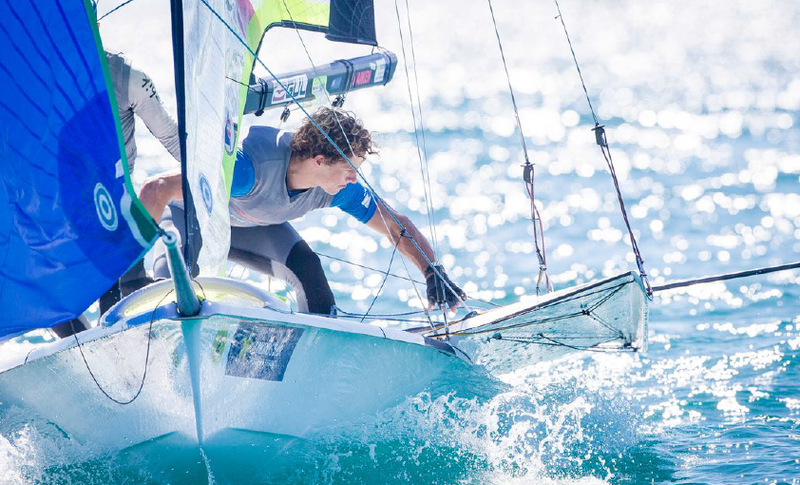 We decided to use the Eurosaf regatta in Palma as training and a chance to get race-tuned for the upcoming World Cup regattas in Hyeres and Weymouth. It felt great to be back on the beach in Palma again - the regatta is a favourite of ours, with mixed conditions and this year was no exception, although a little colder than we usually like! The 49er is so fun to sail that when you have a few weeks out of the boat that first sail back is pretty exciting and makes you feel ten years old again! A really strong fleet made the trip over and we had almost every condition imaginable over the regatta and four days training beforehand. We began the regatta relatively well, with some solid scores on a very gusty and shifty first day. We started poorly and gave ourselves a lot of work to do after some deep first mark positions, but we charged through the fleet and got off to a decent start with two results inside the top ten . Day two was a more conventional Palma sea breeze day, although we were raced late in the day after the girls finished. By this time the wind had become more unpredictable, but we sailed a great first race and won comfortably. After a solid first lap in race two we were in third, but the wind completely dropped and we made a slight tactical error, which we were punished hard for and finished 8th. The following day we split into Gold fleet and launched to a building Easterly breeze and perfect skiff sailing conditions. Flat water, 14-18kts and some incredibly tight racing made for one of the best day's racing in a long time. We started and sailed really well, scoring a 3,6 in the first two. The final race was again late in the day and the wind began doing some crazy things. Despite being in a solid position and in the top ground about 50m from the first mark, somehow we rounded in tenth and an error on the downwind cost us further places, turning what should have been another solid result into a 16th. It was a disappointing end to a day when we sailed really well on the whole. Day four was a strange one for us - the wind was in the 14-18 knot range and steady - usually one of our strongest conditions. We struggled a bit for speed and managed to salvage a 10,10 from the morning races after some good comebacks. Back on shore, we found out that we were slightly off with our settings and after a tweak to the setup felt good for the afternoon race. We got a great start and won the left on the course - usually the favoured side. Unfortunately, the right came in strong and we rounded the first mark with a lot of work to do again. We missed the gain on the right again on the second lap and struggled round to a 16th, capping of a very frustrating day. The final day of Gold fleet was sailed in lighter sea breeze conditions. We had a poor start in the first race and with a very left hand favoured track meant there was little room for position changes. In the second race we were set for a great start, but with seconds to go a German boat took us out and destroyed our chances for a good race. The final race of the day we got off the start line to record a 4th and cemented our position in the medal race, although frustratingly we were left feeling that we hadn't given ourselves much chance in the races! The medal race was close as ever and we finished 5th, placing us 7th overall. On the whole, we were disappointed with the end result as we felt we were fast enough to medal comfortably. Our decision-making when the wind went tricky late in the day cost us a lot of points, but this was a training regatta and it is important to remember that. 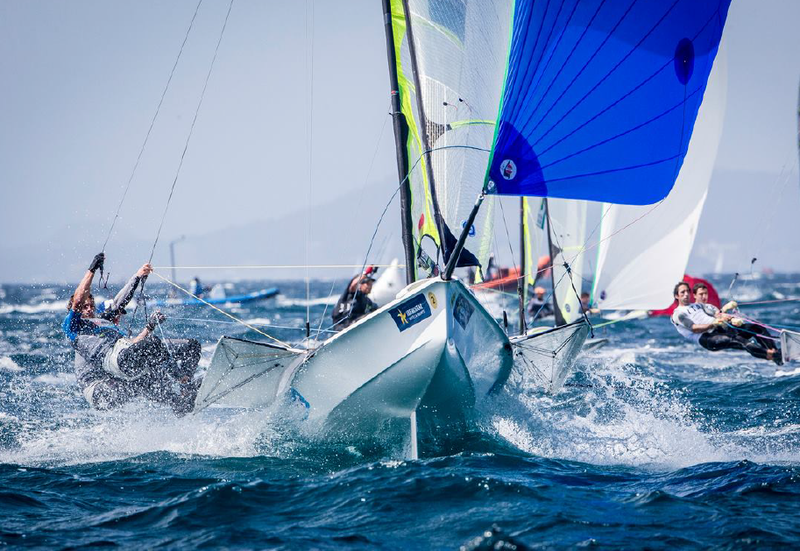 We will polish our racing at a training regatta in Hyeres, prior to the World Cup regatta and we will go there with confidence and excitement.